ALTernative Designs: 4 Glossy Black Sugar Skulls Left!! 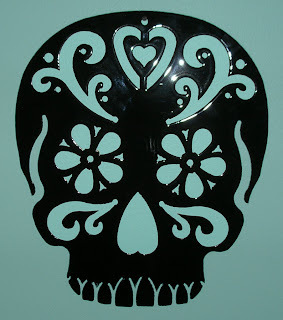 4 Glossy Black Sugar Skulls Left!! There are only 4 sugar skulls left from the first batch. They are cut from steel, painted and coated with automotive clear-coat. Want one?? They're $20 with $5 shipping. Hit me up on Etsy or Facebook and I'll invoice you.